Much has changed in the technology of anchoring a boat safely in recent years. So much so that any prudent mariner, either leisure or professional, would be wise to review what they have on their vessel, gain a better understanding of what an anchor actually does, and see what characteristics are important. Anchors used to be gauged by their weight, but is that still the case? Ever since man ventured out onto the water using water craft to fish, travel, transport goods, or (in more recent times) for pleasure the most important thing he or she had to be able to do was park the vessel. Of course, initially, this simply meant dragging it up on a beach, but the time soon came to stop (anchor) while on the water. Looking past the development of ropes, chains, cables and other ancillary gear needed to connect the anchor to a boat, let us take a look at where we started and where we are today. At first there was the stone on a rope. The first innovations and improvements soon followed. Someone thought to drill a hole in the stone to make it easier to tie the rope to it. About 2,000 years ago someone else encased a stone in a wooden framework adding the first flukes to improve holding. Today we call this a killick anchor. 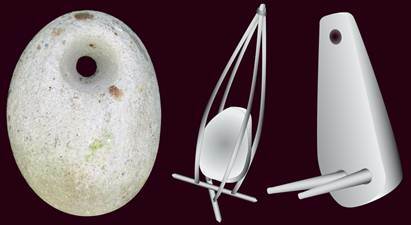 Another innovation was drilling further holes in the stone to attach flukes directly to the stone. Of course there were many permutations of this, but they all meant that boats were anchoring ever more securely. It literally took millennia to move from such a rock on a rope to the admiralty pattern anchor introduced in the 19th century. In the meanwhile, the Romans developed an anchor somewhat reminiscent of it, though lacking the necessary steel forges they made the collar and stock out of lead with the shaft and flukes still being made of wood. Both the roman anchor and the later Admiralty anchor have a stock at one end of the shank that is at right angles to the pair of flukes. The stock orientates the anchor so that one of the flukes digs into the ground irrespective of how the anchor hits the bottom. Today the admiralty anchor (Fisherman, Luke, etc.) graces government building lawns and can be found in fancy jewellery designs. 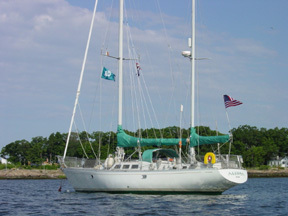 However, it is also still very much in use and can be found on classic and modern cruising boats. A century later the hinged stockless fluke type anchor that is used on many large ships to this day was developed. As it had no stock, this anchor was easier to stow. Adding a hinge was a big innovation as it allowed the paired flukes to dig into the bottom. The next big innovation was the Coastal Quick Release anchor (CQR, also known as Clyde Quick Release) which was introduced in the 1930s by Sir Geoffrey Ingram Taylor. It is a single fluke anchor with a weighted tip based on a double bladed agricultural ploughshare. Like a plough, it is designed to dig into the bottom. The hinged shank is intended to permit directional movement without the anchor pulling out. The CQR represented a major advance in anchor design and stimulated 20th century innovations for recreational anchoring. 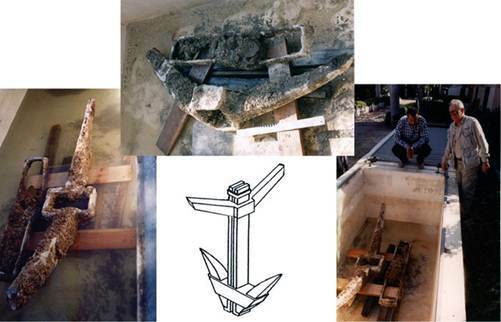 Recent studies have shown that its holding power does not compare well against newer anchor designs. In the 1940s Richard Danforth redesigned the fluke ship’s anchor to have wide sharp triangular flukes and a stock at the crown for use on sea planes and military landing craft, which had been using the more cumbersome Northill anchor prior to that. Much lighter than the stockless fluke, his steel Danforth anchor has a high holding-to-weight ratio and soon found its way into the pleasure boat market. At about the same time the Brittany anchor was introduced in Europe. It too is a derivation of the ship’s anchor. It has wide, flat, and pointy flukes, and has no stock, though some newer versions do. Lighter versions of the Danforth followed and today the aluminium Fortress anchor is one of the more popular brands. This is a very good anchor for muddy bottoms. The first of the claw type anchors was invented by Peter Bruce from the Isle of Man in the 1970s to secure North Sea oil rig platforms. It was later scaled down for small boats, and copies of this very popular design abound. The claw anchor sets easily and very fast, though its holding power is not as great as the newer scoop type anchors. Claw anchors are quite popular on charter fleets as their percentage set on the first try in many bottom types is very high. The Delta anchor was derived from the CQR. It was patented by Philip McCarron, James Stewart, and Gordon Lyall of Simpson-Lawrence Ltd in 1992. It was designed as an advance over the anchors used for floating systems such as oil rigs. It retains the weighted tip of the CQR but has a much higher fluke area to weight ratio than its predecessor. The designers also eliminated the sometimes troublesome hinge. This is another oft copied design with the European Brake and Australian Sarca Excel being two of the more notable ones. Although it is a plough type anchor, it sets and holds reasonably well in hard bottoms. With the invention of the Bügel Anker by three time circumnavigator German Rolf Kaczirek in the 1980s, anchor design started to get really interesting. He wanted an anchor that was self-righting without necessitating a ballasted tip. Instead he added a roll bar. Instead of a plough share, he used a flat blade design. As none of the innovations of this anchor were patented, copies of it abound. It was the Frenchman, Alain Poiraud, who changed everything with the introduction of the scoop type anchor in 1996. The scoop anchors are shaped like a shovel with a concave fluke. Remove a shovel’s handle and add an anchor shank and you have a scoop type anchor. Just like a shovel is designed to dig, so it is with a scoop anchor – it digs, and if you apply more pressure, it digs deeper. They represent one of the true breakthrough design advancements in the last decades in the marine industry. The common challenge with all the spade type anchors is that they set so well, they can be difficult to weigh. They also tend to bring up loads of muck – both problems we are happy to live with! Alain Poiraud changed the fluke from concave to convex and added a weighted tip like the Delta had. The increase in holding power was immense. He also made the shank hollow in an attempt to have the anchor land on the seabed in the correct orientation. The Spade sets and holds well in most bottom types given sufficient scope. It can also be disassembled for easier storage. Following a similar train of thought, Peter Smith of New Zealand designed the Rocna. He took the thinking behind the flat Bügel anchor with its roll bar and replaced the fluke with a folded concave one with a sharpened tip. He used a shank similar to the Delta and added stabilizing wings plus back fins to make the shape of the anchor more bowl-like similar to the Spade yet horizontally stable while digging. The Rocna sets fast and hold very well in most bottom types. The Ultra is one of the newer scoop-type anchors. Designed by Nejat Övütmen and Yılmaz Yücel, it is manufactured in Turkey by Boyut Marine and distributed in the US by Quickline USA. Completely hand made from 316 stainless steel and hand-polished, the Ultra is a work of art and carries a Lifetime Warranty. Like the Spade, the Ultra has a weighted tip and hollow shank that assist in proper orientation as it drops to the sea bed. Like the Rocna, the Ultra also has side wing plates. Differing from its predecessors it has a non-chain-foul-bar a downward curved tip and a profiled shank. Of the three scoop anchors we have tested, the Ultra sets the fastest and holds very well. As one might suspect, there are many variations of the scoop type anchor available today. We selected the above three as these are anchors we have actually taken out cruising for extended periods. There are several others already on the market, such as the Manson Supreme, Manson Boss, Spoon, Seablade, etc. We have found that the scoop type anchors outperform all other anchors in our collection when comparing all-around performance in different bottom substrates (sand, mud, shell, weed) using different rodes (chain, rope, or combinations) and under varied conditions (high wind, reversing current or wind direction, etc). These anchors veer well, hold reliably, and dig ever deeper as the wind increases. One observation of differences is that the Spade may need a bit more scope than the Rocna and Ultra. Other than that, the Ultra sets the fastest and all three hold very well. The new design anchors do introduce a modern challenge. They come up with so much muck in their scoops that they can be difficult to weigh without a windlass. A wash-down hose or multiple buckets of water are therefore necessary to clean the anchor and rode. That said, we would much rather endure the difficulty in weighing an anchor than getting it to set in the first place, or for that matter worrying about its holding ability. We are converts to the new generation scoop type anchors and have retired our CQR as well as our Admiralty type anchors from active duty. In fact, we are so convinced about the setting and holding ability of these newer anchors that we are intending to help re-write many of the cruising guides. Where anchorages are rated as having poor holding, we believe that they may have been rated with poor anchors, as we have personally found the holding to be good. So if your anchor is not holding as well as you might like, consider your options. The insurance of having a good modern anchor may just let you sleep peacefully through the night secure in your chosen anchorage. It’s up to you!